Music: Dave Brubeck Quartet, “Live in Stockholm” – This year marks the 50th anniversary of the groundbreaking release of their song, “Take Five.” What was and still remains to be so amazing is that this was not only a jazz song that became a popular success, but that it is in the unique and somewhat awkward time signature of 5/4. For all of you non-musicians out there, this is the equivalent of a 5 legged horse winning the Kentucky Derby and then going on to win the following season of “Dancing with the Stars.” NPR highlights the story here. So, my dad HATED beets. I don’t think that hate is a strong enough word. I’m pretty sure he wouldn’t go near the suckers. Because of this, I have never tasted one. I have been seeing so many yummy recipes popping up everywhere with beets. So, we’re trying them! 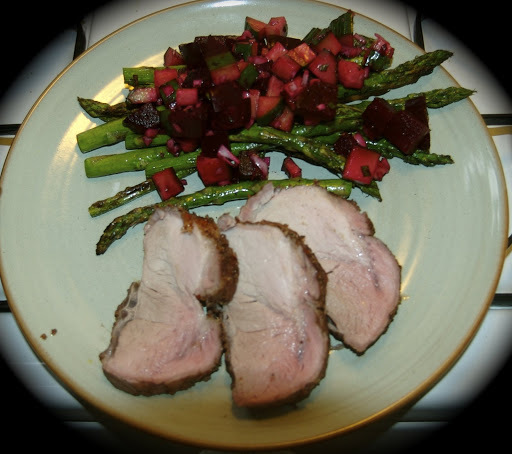 I figured this would be a good intro – roasted beets in a dressing with one of my favorite veggies of all times, grilled asparagus. The recipe was good. Not great, but good. It needed a little something more…maybe a little feta sprinkled on top. It was definitely enough to spark my interest in beets though. I am going to try some more recipes and figure out how I like ’em. I must admit, the earthy taste, smooth texture, and fantastic color is hard to resist. Anyone have suggestions for beets? What’s your fave recipe? Preheat oven to 400. 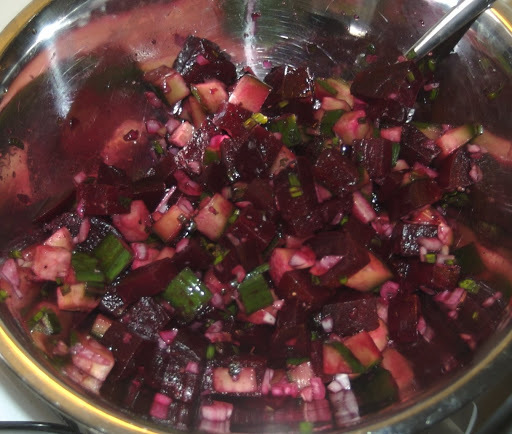 Wrap beets in foil and cook for 45 – 1 hour until a fork comes out easily. Once cool, trim beets, and remove skin (a paper towel helps, jut rub skin and it comes off). Dice beets into 1/2 inch pieces and place in medium bowl. Add rest of ingredients, excluding asparagus and stir to combine. Can be made 2 hours in advance and chill in refrigerator. Preheat grill until hot and ready. Toss asparagus with EVOO and S & P. Add asparagus to well greased grill and cook, turning once, 4 – 8 minutes, depending on thickness. 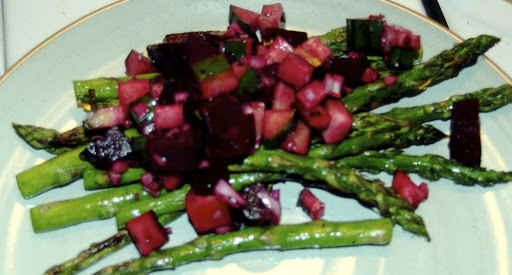 To serve, pile asparagus on plate and top with beet and cucumber relish. Serve immediately.